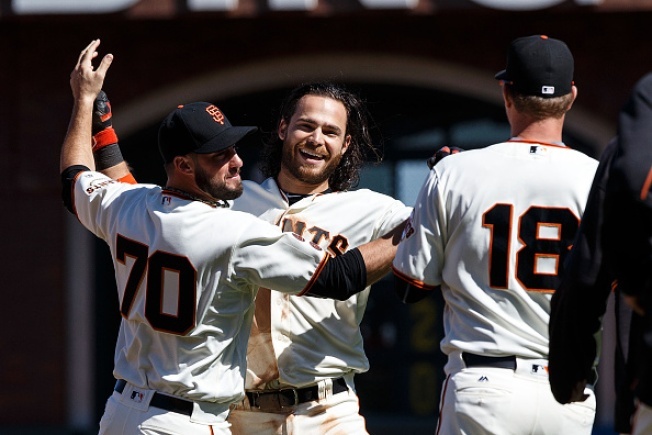 SAN FRANCISCO — The Giants played .500 ball against the rest of the division last season, which came back to haunt them when it was all said and done. The Dodgers had eight more divisional wins than the Giants and won the National League West by eight games. The math has shifted this year, in large part because the Giants continue to beat up on the worst team in the West. After Wednesday’s 4-3 walk-off win, the Giants are 9-0 against the Padres this season and have won 13 of their last 14 overall. Jake Peavy took a shutout into the seventh thanks to a first-inning play from Kelby Tomlinson. The late addition to the lineup in left field hosed Yangervis Solarte at the plate to save a run. A double play shortened the second inning and Peavy stranded runners in each of the next two. He retired eight straight at one point before a double and single put a run on the board and ended his day. The Giants took an early lead with some small-ball. Brandon Crawford singled in the second, alertly took third when Jarrett Parker ground out against the shift, and walked home on Tomlinson’s single. Matt Duffy’s RBI single brought a second run home in the sixth, and Denard Span hit a pinch-hit double in the seventh for an insurance run. Josh Osich gave the lead back in the eighth, grooving a 94 mph fastball that Solarte crushed to left-center for a two-run homer. The Giants stranded the winning run on third in the bottom of the ninth, but the Padres returned the favor. George Kontos entered with runners on the corners and one down in the 10th and got a strikeout and groundout to short. Duffy hit a one-out single in the bottom of the inning and took second on a wild pitch. He cruised home when Brandon Crawford lined a ball off the wall in center. Starting pitching report: Peavy’s final line: 6 2/3 innings, six hits, one earned run, one walk, four strikeouts. By the numbers, that’s his best start of the season. Bullpen report: The homer was the third off Osich this season in 16 1/3 innings. At the plate: Gregor Blanco continued his post-Pagan-injury mini-tear, reaching on a single in the third and then tripling and scoring in the sixth. In the field: Tomlinson again looked uncomfortable at times in left, but he made all the plays that came his way. The highlight was a perfect throw in the first that hit catcher Trevor Brown right in the chest. It’s nice to have a shortstop’s arm out in left field. Attendance: The Giants announced a crowd of 41,363 human beings who remembered that San Francisco can get unfathomably chilly on a sunny day. Up next: A day off! Matt Cain, Madison Bumgarner and Johnny Cueto take the ball at Coors Field over the weekend. The Rockies are going with Eddie Butler, the always-dangerous TBA, and Jorge De La Rosa.